Charm your Valentine with this Victorian-styled gift! This gorgeous Valentine's tower exceeds your high expectations! 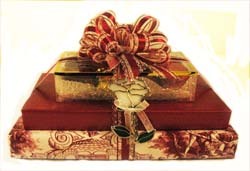 Wrapped in beautiful papers perfect for the season, and topped with a festive bow. A rose ornament completes this perfect gift!